Dr Bawumia, NPP’s 2016 Veep candidate, led the presentation. 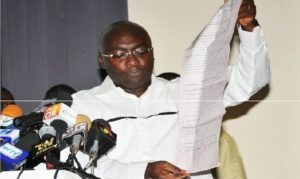 The New Patriotic Party (NPP) have described as “incurably flawed” Ghana’s voter register after its investigations revealed “damning” evidence. 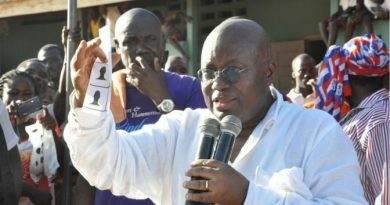 Addressing a press conference on Tuesday, August 18, Vice Presidential Candidate of the party said nationals from Ghana’s neighboring countries have infiltrated the voters’ register used for the 2012 elections in particular. Dr Mahamudu Bawumia alleged that after just 10 per cent of his party’s investigations into the issue, names of 76, 286 persons have been found in Ghana’s register as well as in Togo’s, which was publicly displayed prior to the April elections. 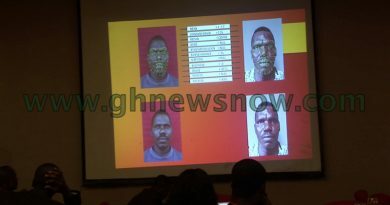 “We used what we call facial biometric recognition technology,” Dr. Bawumia stated, explaining that the technology analyzed, for instances, the distances between the eyes, ears and so on. He said the investigation team will soon look into the register of the Ivory Coast “to check the western border as well and then we will look at Burkina Faso”. According to the former Deputy Governor of Ghana’s Central Bank, there is no doubt that Ghana’s register has been compromised. He, therefore, called on the Electoral Commission of Ghana to consider, as a matter of urgency, getting a new register, to be made available by June, 2016, he suggested.